This section of the website highlights the countryside sites within Denbighshire, which provide differing levels of easier access routes for people with varying levels of mobility, allowing everyone the chance to explore the diverse and outstanding landscape of Denbighshire. The detail provided within the interactive maps allows each user to decide whether they feel the route is suited to their individual needs and ability. Numerous routes are available to explore, with a link to each site featured on the left of the page. Interactive maps have been produced for each site, which hold detailed information about each of the routes such as; path surface, width and terrain; gates, stiles and other path furniture; and other facilities such as toilets, parking and where to buy refreshments. In addition to the map, an A4 printable document is available for each site. This contains a map of the route and important features, such as the narrowest section of path, the location of gates, toilets and even the nearest bus stop. From the canal towpath in Llangollen, which affords spectacular views of Castell Dinas Bran and the Dee Valley in the south of the county, to the popular Brickfield Pond Nature Reserve in Rhyl, there really is something for everyone. These routes have been supported by the Rights of Way Improvement Plan funding programme, as funded by Welsh Government and administered by Natural Resources Wales and Cadwyn Clwyd Cyfyngedig’s Green Tourism Project. 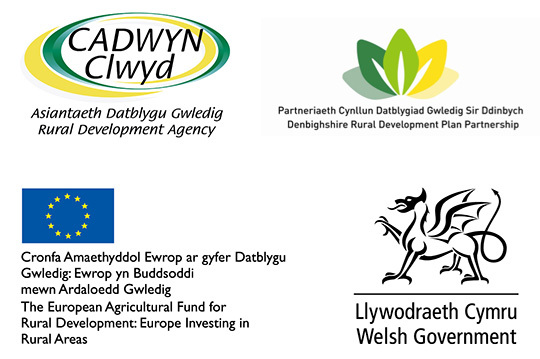 Cadwyn Clwyd are committed to supporting sustainable tourism in rural Denbighshire and are funded by the European Agricultural Fund for Rural Development and the Welsh Government through the Rural Development Plan for Wales 2007-2013. For more information on Cadwyn Clwyd please visit www.cadwynclwyd.co.uk. Whilst every effort has been made to make this resource as accurate as possible, neither authors nor publishers accept any responsibility for the consequence of errors.